Saxophonist & composer Lucas Pino has released a title that even in the creative jazz world needs some explanation. “That’s a Computer,” released in the fall of 2018 with his 10-piece jazz band No Net Nonet, takes its title from a comment made by one of Pino’s’ professors at the Julliard School. In positive reaction, Pino has turned it around with the strength of musicianship and composition and originality – and yes – with feeling – that is heard on Pino’s “That’s a Computer” release (Outside Music, 2018). Following-on several noteworthy positive reviews ranging from DownBeat, “Pino shows himself to be an inventive melodic thinker” and All About Jazz, “ It’s a pleasure to hear groups such as Lucas Pino’s No Net Nonet, which are remarkably creative even as they adhere to the basic precepts of melody, harmony and rhythm.” Pino has produced the results worthy of self-affirmation. Over his career, Pino has established a musician’s resume of enviable credits. 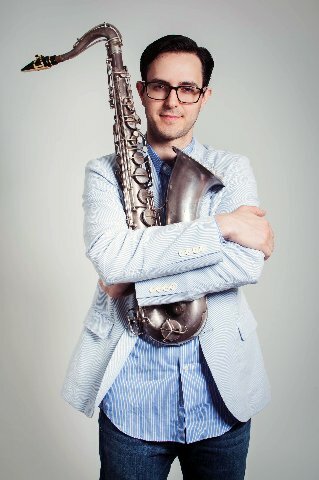 As a high school junior, he won the DownBeat Student Music Award for Best Instrumentalist Soloist in 2004, and went on to attend the Brubeck Institute, finishing his Bachelor of Fine Arts degree in Jazz Performance at The New School in 2009. He received a Masters of Music from Julliard in 2011. He has since travelled the world as well as throughout the United States and Canada. On “That’s a Computer” we find a winking challenge to the off-the-cuff remark of a former professor, that over-rides anything mechanical as exemplified by the first cut. “Antiquity” has a slow and remorseful beginning on a longing saxophone that soars and brightens with promise and beautiful piano accompaniment by Glenn Zaleski– with wonderful tempo changes. Additionally, “Film at 11” shows off a musing slow, sad serenade of saxophone and piano, creating a smoky-filled night club atmosphere, with punctuated piano key runs and wistful horns that carry a meandering melody forward. A reflection of the inevitable tragic headlines of late-night news, this tune deliver’s a mood you can truly feel. Both “Antiquity” and “Film at 11” are statements of absorbing reflections in original jazz composition – nothing programmed here. Other selections include “Frustrations” featuring No Net Nonet Chilean-born vocalist Camila Meza, with a bossa nova refrain that meets minimalist piano chords from Zaleski and saxophone accent by Pino with spare guitar notes from Rafal Sarnecki. “Baseball Simulator 1000” jaunts into the mix with an upbeat marching-band blues pace and beat, taking its name from a vintage Nintendo game that Pino admits was a time-consuming passion. But, as the last cut on this release, it makes a spirited finale.